Prototype: 3 different design German Federal Railroad (DB) four-axle express train passenger cars. “Bottle Green” basic paint scheme. 1 type A4üe-28/55 express train passenger car, 1st class. 2 type B4üwe-28/51 express train passenger cars, 2nd class. The cars look as they did around 1960. Model: All of the cars have Relex couplers. The trucks are Minden-Deutz design. The train destination signs are imprinted with the train routing: Munich – Augsburg – Würzburg – Bebra – Hannover – Hamburg-Altona. The cars have different car numbers. 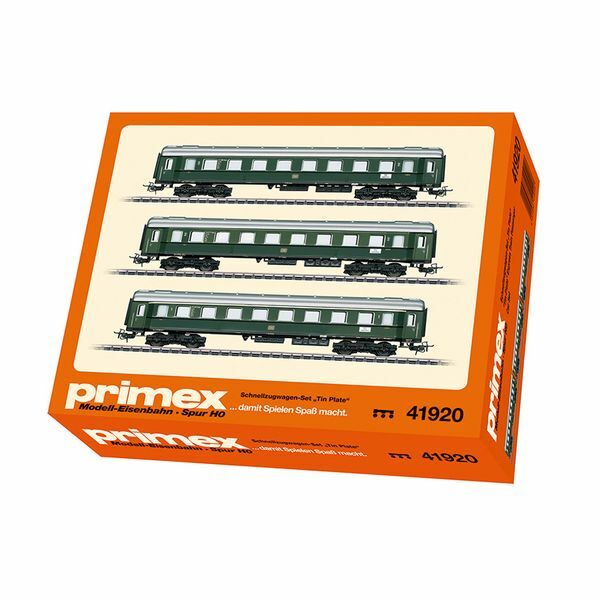 Each car is packaged individually in a marked box based on the Primex packaging at that time. There is also a master package. Length over the buffers per car 22 cm / 8-5/8“.